Chicago: Pellegrini & Cudahy, 1947. 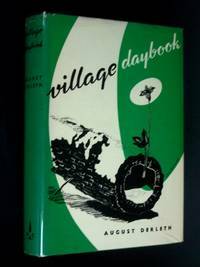 Notes on a year in the local village & woodland life; Derleth notes it as one of his best books in 100 Books By August Derleth. SIGNED by Derleth, with "Sincerely", on the half title. Hardcover, full green cloth, gilt titling. Light wear to book, faint tanning to front endsheet; jacket shows light rubbing, minor edgewear, head of spine chipped, two small holes in rear panel, affecting three words. Text clean; , 306 pages; illustrated withwood engravings.. Signed by Author. First Edition. Hard Cover. Very Good/Very Good. Illus. by Frank Utpatel. Small Octavo.